When you go to a conference there are always a few surprises and chances to learn new things, Friday’s Military Reporters and Editors gathering Friday in Arlington, Va., was no different. 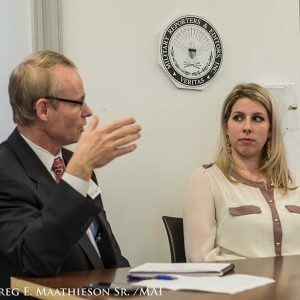 Margaux Ewen’s with Reporters Sans Frontieres discussion with John Donnelly of Congressional Quarterly on safety of journalists in conflict and non-conflict zones was one of those surprises and learning times. The surprise, to me, were the number of journalists killed in Mexico, putting it in the top five most dangerous countries. Here are links to its website and its handbook of safety tips for journalists.